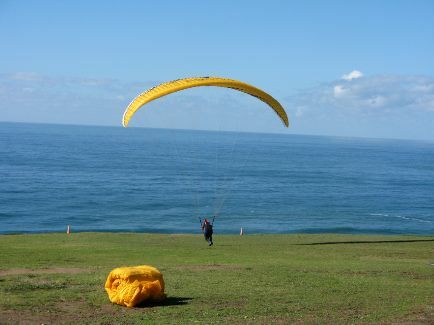 Don't miss the Torrey Pines Glider Port - a Fabulous Paragliding or Hang Gliding Adventure above Blacks Beach in La Jolla, California. Its great fun to watch, and for those brave enough to leap off a cliff, you can soar like a bird along the 300 foot high bluffs above the beach below. Parking: Free parking in the dirt lot at the gliderport. Watch out for really big potholes! Getting There: Just a short walk from the parking lot. 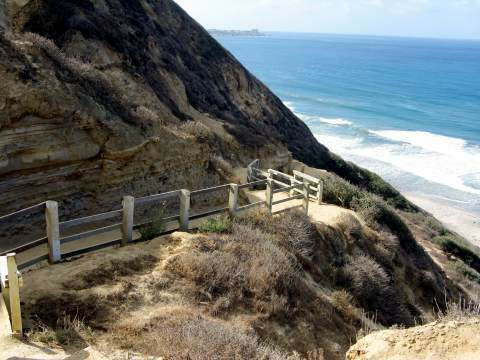 High Tide Access: If you hike down the 300 foot bluff on the Torrey Pines Gliderport trail to Black's Beach, it is usually accessible. Access if you walk north or south along the beach may be limited above 3 feet MLLW. Disability Access: Poor. Dirt parking lot can be full of potholes. Glider port area is on a grassy lawn. Hazards: Inherent risks associated with hang gliding and para gliding; steep unstable cliffs - stay back from cliffs as they can slide or large boulders can drop, do not attempt to hike down on any trail except the official Gliderport trail to Black's Beach. This is one of the best things to do in San Diego. The views are fantastic, and it is free and fun the watch. If you want to enjoy the thrill of hang gliding or paragliding, try a tandem ride with an instructor first. 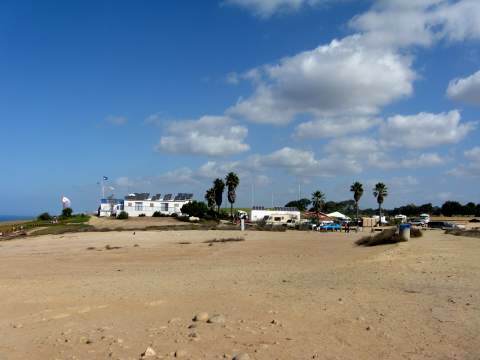 They do not take reservations because it depends on the wind, but recommend you call the Torrey Pines Glider Port at (858) 452-9858 around 10:30 in the morning for an update on wind conditions before you visit. Bring a jacket, sneakers, (heavy jacket and gloves in winter) and $150 - $175 for your tandem flight. No age limits. When you arrive you will park in the dirt parking lot near the buildings. 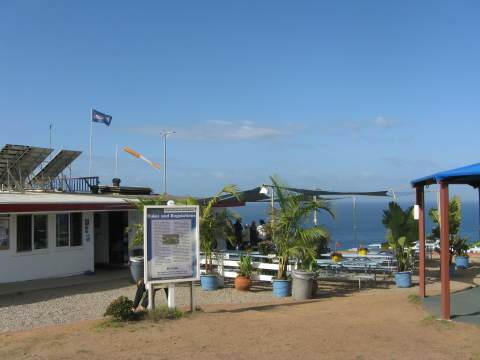 While you are there, you can enjoy a deli sandwich, snacks, or drinks from the Cliff Hanger Cafe. Typically you do not have to wait more than 45 minutes for a flight. The views are so spectacular that you won't mind anyway! 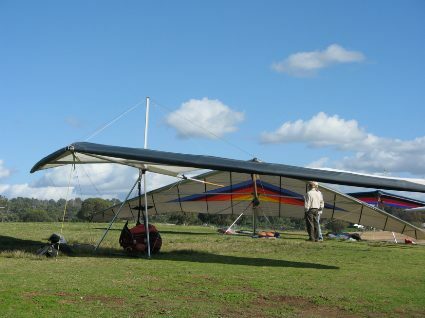 There is 5 - 10 minutes of ground training with your tandem instructor before you are ready to take off. Hang gliding is one option. Just run and leap off the cliff (OK, the wind will pick you up and off you go). 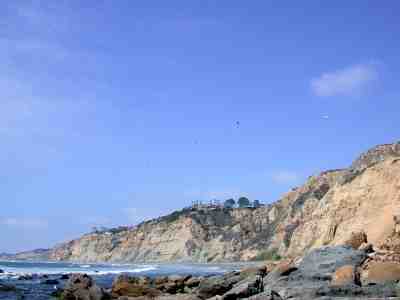 Spend 20 - 25 minutes flying about the cliffs of Torrey Pines. Get a bird's eye view of Black's Beach, Torrey Pines Golf Course, La Jolla mansions, and the beautiful La Jolla coastline. Then it is time to come in for a graceful landing. 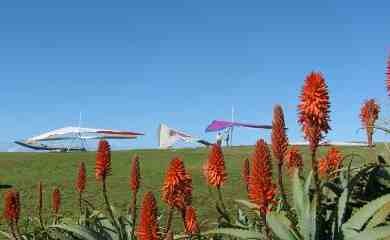 Hang Gliding Torrey Pines is another option. Get ready to soar like a bird. 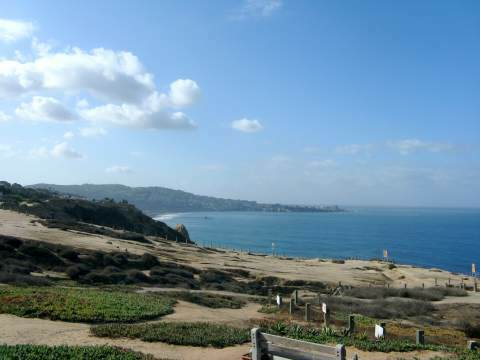 Bring your camera and capture some great views of La Jolla. Optional Hike to Black's Beach From TorreyPines Glider Port - If you want to hike down the steep trail to clothing-optional Blacks Beach, the trail entrance is at the end of the parking area to the left of where all of the "unstable cliff" signs are located (far left in this photo above). It is rugged and steep but has stairs and rails. Wear sturdy shoes, and if you plan to stay after sunset, bring a good flashlight for the hike back up. Warning: do not take any trails except this one or you may get stuck on side of the cliff and suffer an expensive and embarrassing rescue, become seriously injured, or even die. This is no joke!